Hey stampers! 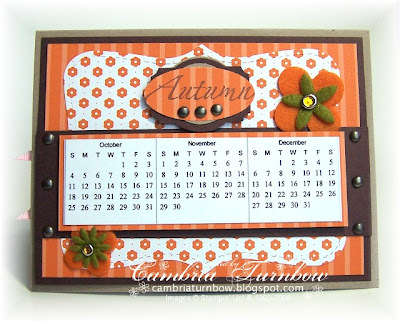 At our last stampin meeting, my friend Nancy Littrell brought this cool calendar she made. You can see it here in her SCS gallery. I've wanted to make one,but other stuff got in the way. 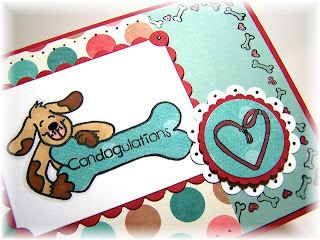 Then, my friend Nancy Morgan posted this awesome tutorial, so I decided to just do it! I adore the Nancys. :) Thanks girls... for sharing all your awesome ideas and creations. 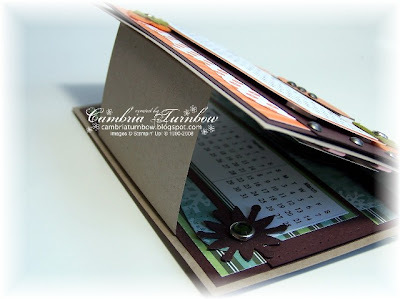 I changed each page just a bit, but I always used Stampin'Up! 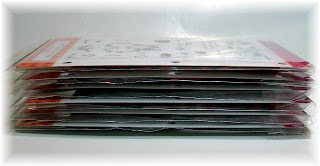 designer paper. One side for the base 3 3/4 x 5 mounted on a piece of Chocolate Chip 4 x 5.25. The Top Note piece was always the opposite side of the designer paper. 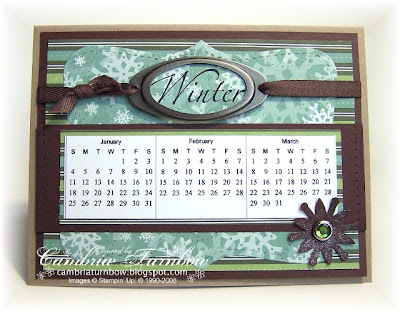 The only stamp set I used was Season by Season. The rest was made using either SU! 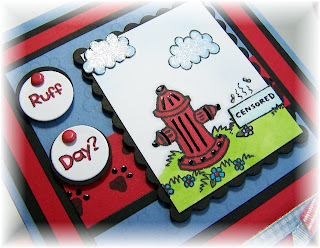 Sizzix Dies or Punches. 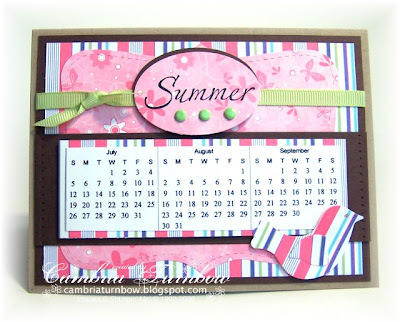 The whole calendar is on one piece of Kraft card stock cut 5.5x 8.5 and scored at 4 1/4. Just like you'd cut for a regular sized card. I changed the closure a bit. Instead of using ribbon, when I attached the chocolate chip layer onto the Kraft base, I did not add adhesive to the bottom portion. This way, you can slip the base that holds it open and upright, right between the Kraft base and the chocolate chip. This holds it open nice and sturdy. The base piece was a scrap on my desk. It measures 4 x 3 scored in one inch on each end of the four inch side. Have a wonderful Sunday! Thanks for stopping by! Happy Saturday! Hope you all had a wonderful weekend so far. Did you get all your shopping done? As much as it freaks me out to be shopping in all the crowds, it must be nice to finish your shopping all in one day. 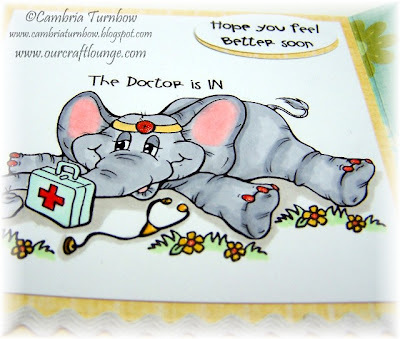 I made this cute little card for a very special little girl, who's having a really hard time right now. You can read about my friend Laurie and her daughter here. I sent the family a card a few weeks ago, but I want to send something just to Alison to hopefully bring a smile and let her know how many people are thinking of her and wishing her well. This is a Tri fold card I designed back in October 2005 for Portland SU! Regionals. 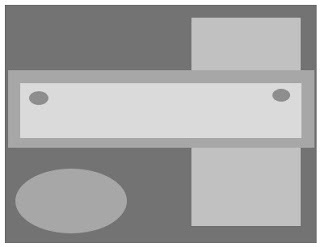 You can find a tutorial here that I wrote for Scor-pal . 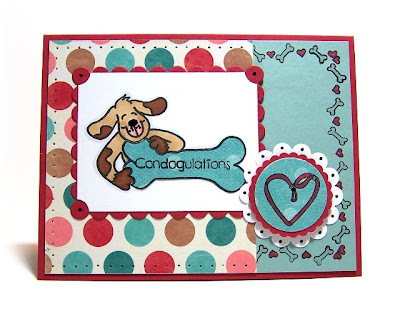 These cards are easy and fun to make. You can't really see in the photos, but it's really cool... you just HAVE to touch it! Love the sparkle that the Spica pens add.... and so easy to do in those little spaces. I also used the yellow glaze pen on the stethoscope and more Spica on the flowers. Paper: Just Dreamy2 (My Mind's Eye), Neenah White, Prism Island Mist Light. Ink: Brilliance Graphite Black, Copic Markers C1, C3, E21, R20, Y21, YG11,R05, W1,G000. Other: Sakura Glaze Pens, atyou Spica Pens, Circle Nesties, Cuttlebug, Ric Rac (Walmart), Curly Label Punch (SU! 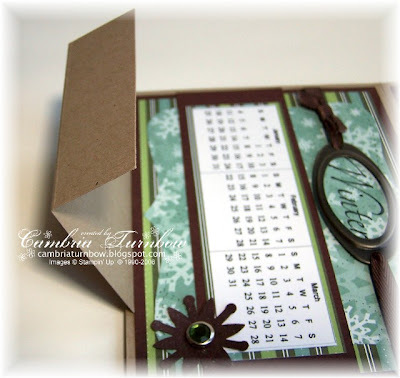 ), Small Oval Punch (SU! ), American Crafts White Ribbon, Scor-pal. Enjoy your Saturday... thanks for stopping by! Good morning! Is everyone out shopping? I hope someone picked me up some socks... I need socks. I had NO idea about the sock deal on Black Friday.... see, I told ya I've never been brave enough to travel out today! I hope you all find awesome deals and you get home safe and sound. So, I FINALLY found some time to stamp in between making pies and deviled eggs yesterday. Alex posted a sketch challenge over at the OCL forums, and this is my sketch card... better late than never right? 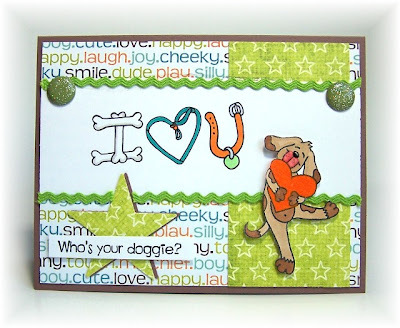 The doggie's heart is flocked with Orange Crafty Flock... it's so cool. We'll have it soon at Our Craft Lounge. So what have I been so busy working on? One of the things that was keeping me busy (and a couple dear sweet friends), was preparing for make and takes and classes for Marianne and Kimberly. Are you in southern CA? Would you like to take a class with Marianne Walker from Copic Markers and Our Craft Lounge? You can also find this information over at the Lounge in the forums. We'd love for you to stop by and say hello! Paper: My Mind's Eye, Close to Cocoa, Neenah White. Other: Brads (Imaginisce, eye of newt brads), Crafty Flock, Large Star Punch (SU! ), Dimensionals, Ric Rac (Walmart), Quickie Glue Pen. Besides wishing you a Happy Thanksgiving I'd like to share some things going on all over cyber space. From Shimmerz: Customers can buy Shimmerz directly from Shimmerz starting Thursday. up to their normal price on Monday, Dec 1. From Our Craft Lounge: Double ticket weekend. 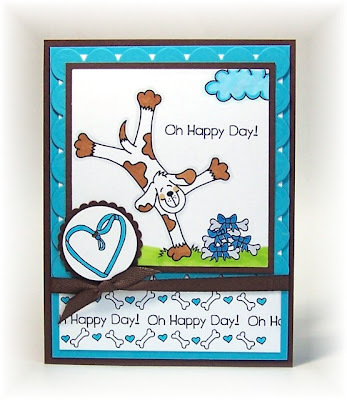 :) Double tickets included with purchase of each stamp set. Do you brave the crowds and shop after Thanksgiving? Can you believe I have NEVER gone? It freaks me out..... all those people. If you go, good luck, and have fun! I think I will stay at home and do some online shopping... and maybe stamp! I have having withdrawals. Lilstamper posted this cool sketch in the challenge section of our forums over at Our Craft Lounge. Feel like playing along? We'd love to have you join us! Check out the forums, and share a link to your creation! If you upload to SCS please use OCLSC01 as the keyword so we can find your card. 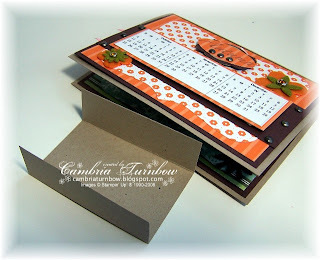 Want to see some samples for inspiration? Go ahead, check out our thread in the forum, or go to SCS and punch in the keyword. Hope you can play with us... I can't wait to see what you make! Also.... we drew our first winning ticket! It's also posted in the forums! TGIF stampers!! Whatcha doing over the weekend? I'm helping Grandma with her open house/house warming. There is going to be cake... chocolate cake! Tomorrow my daughter is going to her first sleepover. She is beyond excited. The twins have a birthday party at the bowling alley on Saturday and Sheldon is going to see that new movie... shoot, forget what it's called... Tonya, what's it called? I just busted myself again.... yah, it's late, and my brain isn't working. It's Friday.. which it means it's time for Beate's Weekend Sketch. I used the set Pat the GOOD Dog. I added some shazam with Burgundy Shimmerz to the hearts and Sakura Clear Glaze to bones in the border. I also used my Sakura Black Glaze pen to add some dots and make that doggie nose glossy and raised. Have I mentioned how much I love those pens? Paper: Just Dreamy2 (My Mind's Eye), Prism Island Mist, Neenah White, Riding Hood Red. Other: Shimmerz, Sakura Clear and Black Glaze Pens, Round Scallop Punch (SU), Round Scallop Punch (Marvy Yellow), 1 3/8 inch Circle Punch, Ticket Corner Punch, Crafter's Took Kit, Dimensionals, Scor-Pal. Stamps in DA HOUSE Baby!! Oh Yah! I'm SO excited!! My first OCL stamp sets arrived today! Well, okay, not REALLY my first, but my first sets that are totally put together and finished. We sent out a few sets without the panels to some friends (and me) so that we could have samples made up before the release, so today, I got my sets the same way they arrive to you! So, this is how they come... The panel is a thick, laminated like plastic. The front side has the images all colored and pretty. This is one out of the bag... you can see that they are also three hole punched so that you can store them in a binder (and we have a system coming soon). 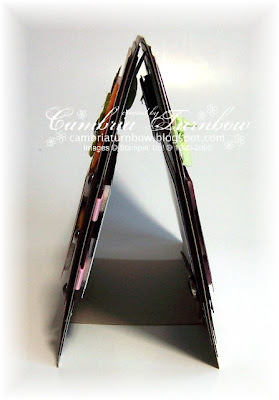 They arrive in a nice bag with a triangle loop at the top for those of you who use the Clip It or other hanging system. Turn it over, and the stamps are clinging to the back! 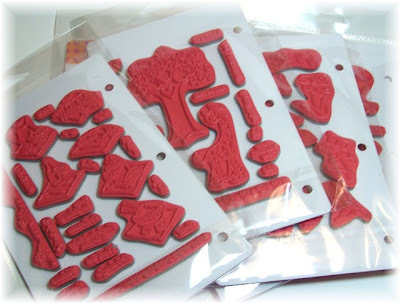 Just peel them off, stick them on an acrylic block and stamp away! When you are done, clean your stamp and stick it back to the panel. How cool is that? Our Crafty Cling rubber is deeply etched pink rubber... it's beautiful (Okay, so I admit, I might be a TAD biased). Our Crafty Clear arrives the same way! Marianne colored most of the panels, so it's like getting a bonus Copic tutorial to boot! Oh, and check this out! I stacked six sets! SIX... and look at how little space they take up! THAT floats my boat baby!! Okay, so if you are still reading... thanks for bearing with my excitement of the day! I have to say, even though my husband thought they were pretty cool too, he just didn't have the enthusiasm I thought he should... so I really needed to share with someone who would KNOW how I felt. I had a super busy day, so I need to get to work on Beate's sketch for tomorrow. Before I go though, I want to share a coupon code good for tomorrow only! So, if you haven't shopped with us yet, but you'd like to give us a try, make sure and use the code TGIF at checkout for a surprise discount! Even if you have already tried our stamps and want more.. don't forget the code! Also, check in with us starting tomorrow on our site, because you never know when a new ticket number will show up! Come and lounge with us! www.ourcraftlounge.com. I also want to thank you all SO much for your support. 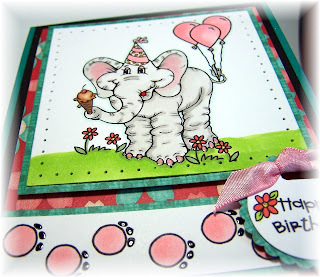 I feel so blessed to have such great stampin friends. See ya tomorrow for Beate's Weekend Sketch!! 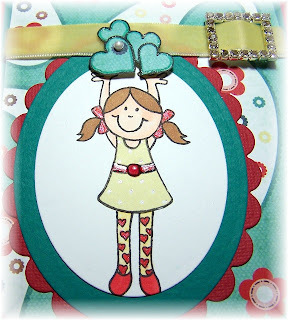 Hello stampin friends! Today I found some time to stamp. Whoo hoo! Everyone got on the big yellow bus this morning. Whooo Hooo! I decided I was going to have a lovely day. I got my cup o' Joe (with pumpkin creamer.. yum) and went next door to visit my Grandma. It's SO nice having her next door... and she's SO happy in her new place. Nothing like seeing my Grandma happy to make my day. Her and her kitty are all settled in. My Mom and Dad helped get some last minute things done for her today.. tomorrow she is having a friend for lunch and Saturday she is having a little open house/house warming. I'm looking forward to it. I'm hoping some of my bananas will get brown so that I can bake up some banana bread. Doesn't that sound good? I'm craving banana bread. Maybe with some mini chocolate chips. Oh, sorry... sidetracked. 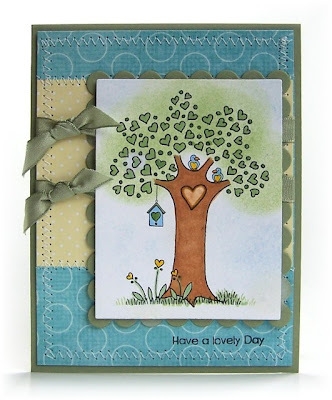 This set is called Tree-mendous Love (my friend Bev came up with that name... isn't she brilliant?). It has a cute giraffe too, but I love the tree. I sponged the tree part with this big round dauber I got from eP. I colored in the hearts a darker green, then added sparkle to the dots with my atyou Spica pens. I then covered the hearts with my Clear Sakura Glaze Pen.... they look and feel embossed. Have I told ya how much I LOVE those pens? Yah, I do. I also used the Spica pens on the birds chests and the heart flowers, but you can't really see that sparkle. Paper: Just Dreamy2 (My Mind's Eye), Neenah White, Mellow Moss (SU!). Other: atyou Spica Pens, Sakura Glaze Pen, Big Fat Round Dauber, Mellow Moss Taffetta Ribbon, Rectangle Nesties, Cuttlebug, Janome Sew Mini, Scor-Pal. My friend Michelle is coming over tonight to stamp... I'm so excited I can't stand it. I got all the laundry off the floor today... that makes me happy. Today, was a good day. Hope you had one too! Thanks for stopping by! This is a set called Going Gourmet. Do you know what Salud means? I didn't, although I'd heard people say it when they toasted. I guess it's Spanish and it means the same as "cheers" or "good health". The lower portion of the card isn't designer paper. 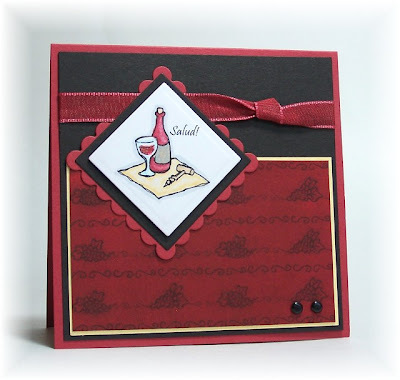 I stamped the border grape and swirl stamp that comes with the set, then smooshed my Riding Hood Red ink pad all over in a circular motion. IRL it looks like suede. From one of my readers.... thanks Gabriela! Salud is Spanish for "Health". When toasting, we just say "Salud" meaning "to your health", but without all the extra words. Salud is also commonly used by politically correct Spanish speakers to wish someone good health after they sneeze, as opposed to saying "Jesus te ayude" (Jesus help you) which in English is loosely (and incorrectly) translated as "God bless you". Paper: Neenah White, Riding Hood Red, Basic Black, Prism Yellow. Other: Vintage Brads, Crafter's Tool Kit, Nesties, Cuttlebug, Riding Hood Red (edges colored with my Copic Marker). This is TOTALLY me... I swear, my Grandma has a better memory than me. I'm ALWAYS forgetting everything!! My kids text me, so that I will remember... how bad is that ? So, sweet Lil' Peanut has a red ribbon on her truck so she won't forget next time. Her nails are all painted pretty too. The photo is dark, so I will try and re-take when I get better light this afternoon, but I wanted to share this morning before my day full of activities starts. Paper: Basic Grey Urban Prairie Paper Pad, Neenah White, Bazzill Maraschino and Green Tea. Ink: Distress Ranger Soot Black, Copic Markers. Other: Sakura Glear Glaze Pen, atyou Spica Glitter Pens, Dimensionals, Nestabilities, Cuttlebug, Circle Punch, Crafter's Tool Kit, American Crafts Element Brads, Scor-Pal. A HUGE thank you for making our first weekend so awesome! I love that so many of you signed up in the forums... I can't wait to start having some fun over at The Lounge. :) Remember to start checking the site for those tickets numbers!! Have a great day everyone! Thanks for stopping by! Whooo Hoooo!! 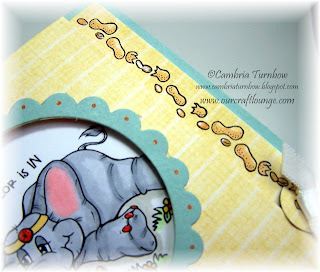 My good friend Kendra is the featured stamper today over at Splitcoaststampers! 1. Change 2 or more things on the card. 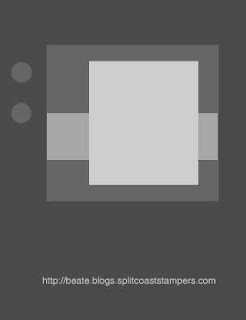 It could be a color combo, embellishments, backgrounds, or even the main image could be different but similar because you don't own the exact image. List the changes in your description. 2. Give credit to the original stamper. Put a link to the original card in your description. 3. Fan Club members may upload today (Sunday). Non-Fan Club members are encouraged to play....please wait until Monday to upload your creations. Thanks! 4. 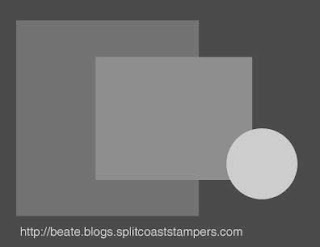 Please note the following regarding Sketch Challenge cards: If you are keeping the same layout but changing most everything else on the featured stamper's card, make sure it isn't a sketch challenge card (SC##). 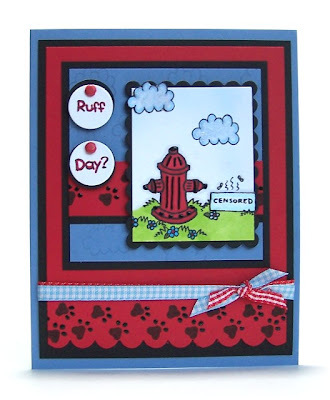 The reason is because it is essentially is a CASE of the sketch since it isn't the featured stamper's original idea. Thanks! 2. 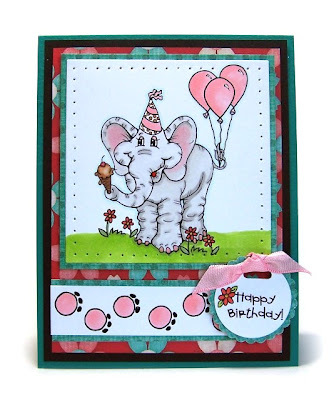 Details section of your card: Describe the changes you have made, give credit to the featured stampers, and link her card. Please don't forget to add a recipe! If you are new to challenges, please feel free to this one or ANY of the challenges at any time. There is no time limit. They are not races to see who can do one first, nor are they contests of any sort. 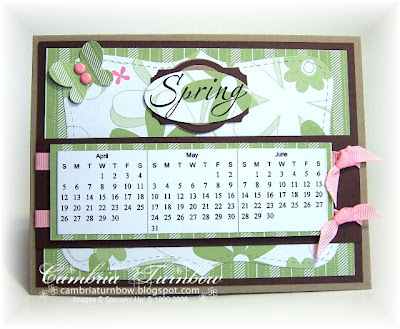 All the challenges are simply to provide inspiration and get us stamping! Kendra's gallery is amazing! I CASE'd this card. I changed the colors, the main image and the bling from the ribbon. Paper: My Mind's Eye, Bazzill Maraschino, Neenah White, Prism Intense Teal. 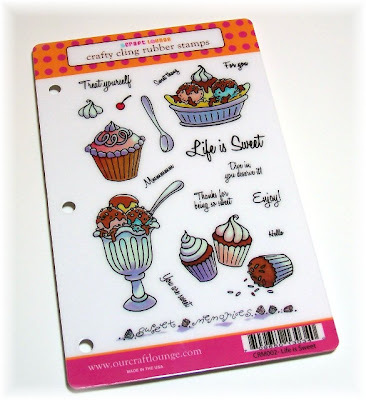 Other: atyou Spica pens, Dimensionals, Ribbon with bling (Making Memories), Little Pearls (Ellen Hutson), Zingz Sticker (Friskers), Oval Nesties, Cuttlebug, Scor-pal. Have a wonderful Sunday! Thanks for stopping by!! I wasn't sure of this set at first. It was one of those things Marianne had in her sketch book that made me laugh out loud. 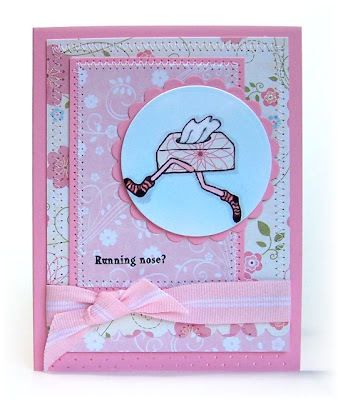 But, I have to tell you that I made a card that said, "Got the Runs?" and my 88 year old Grandma laughed so hard, I thought she was going to cry. She wanted to keep it!! 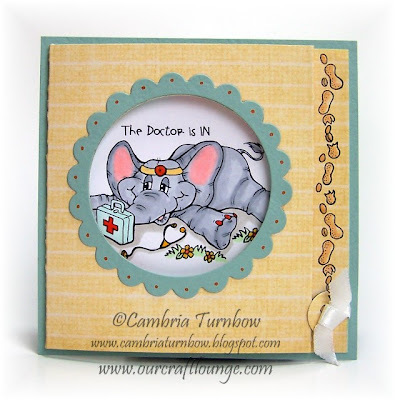 You can see that card over on the Our Craft Lounge web site. Did you notice that when you click on a stamp set to view it, that under the images of the set there is a button that says Image Gallery? If you click on that, a box pops up where you can see other cards and projects made with that set? I LOVE that feature....I think I screamed when Joy showed it to me... she is brilliant. 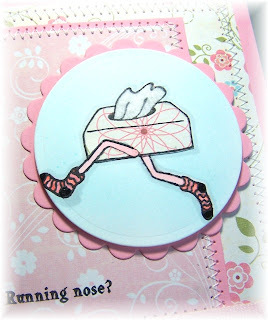 Paper: Fairest of them All (Imiginisce), Neenah White, Pretty in Pink. Ink: Copic Markers, Ranger Distress Soot Black. 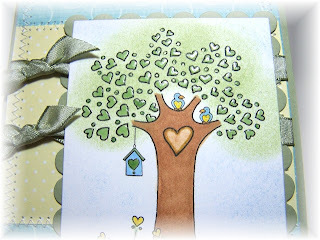 Other: Crafty Flock, Black Sakura Glaze Pen, Quickie Glue Pen, Circle Nesties, Cuttlebug, Wide Grosgrain Ribbon (Stampin'Up! 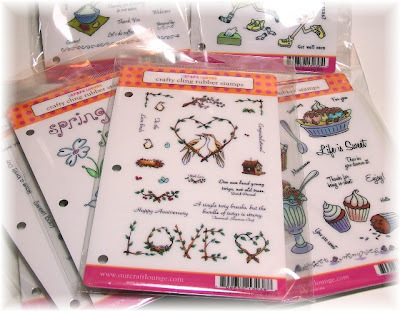 ), Dimensionals, Crafter's Tool Kit, Scallop Edge Punch, Janome Sew Mini, Scor-Pal. Okay, so we got Grandma all moved in yesterday, but we have lots of unpacking and things to do. I can't thank you enough for your support. Remember, that through Sunday, you have a chance to get a pink ticket with each set ordered.... they will be included with your order. Next weekend, we will start drawing numbers!! I cannot wait to start pulling numbers!! Have a great weekend my friends, thanks for stopping by!! 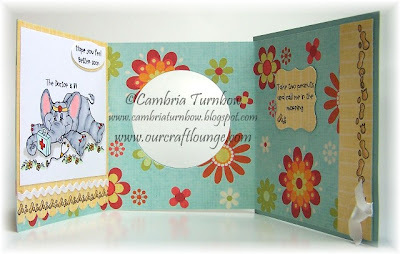 Happy Birthday Our Craft Lounge! Ha... I know, sorry... are you sick of me yet? I promise to post something else soon, but right now I'm having SO much fun stamping with our new sets. 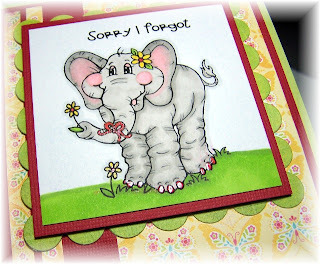 This cute elephant was one of the first images that Marianne drew up for us. I ADORE every wrinkle. I hope you like him/her too. If you didn't catch my "little" announcement you can read it here. I'm so excited this day is finally here and I thank you SO much for your support and enthusiasm. Here is a close up of some of the details. I am SO into my Sakura Glaze pens (Nancy got me hooked all over again with her amazing creations). This time, I used my atyou Spica pens to add that Shazam and sparkle! The designer paper is from My Mind's Eye called Just Dreamy2. You can get all these things over at eP. Okay, now for some fun!! First I want to tell you about the drawing at Our Craft Lounge. It's our Premiere opening all through the weekend. For every stamp set you purchase, you will get a pretty pink ticket with your order. HANG ON TO THOSE TICKETS!! Starting next weekend, we'll start drawing winners. You never know when your ticket number might show up on the web site!! 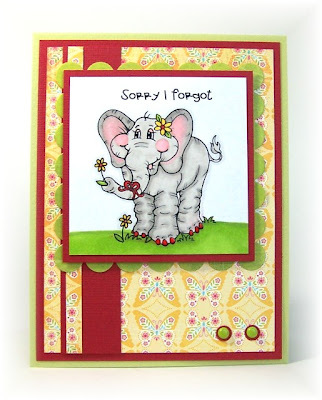 Psst... if you put stamplove in at checkout, you'll get a special discount through the weekend. Okay, one more thing, then I'm off to help get my Grandma moved into her new house! 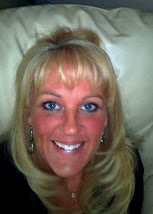 Please stop by and visit my AWESBOMB friends who have helped Joy and I get started. I love you girls, and I can't thank you enough!! (if I missed you and you are posting today, please email me). Thanks SO much everyone! Have a super weekend!!! Good Friday morning everyone! I have a super busy weekend ahead. It's finally time to move my Grandma in next door. Her new house is done and she cannot wait to move. I am so excited to have her right next door..... movers are coming at 8:00! I sparkled up those clouds with December Sky Blingz and added some accents with my Black Sakura Glaze Pen. Paper: Real Red, Ballet Blue, Neenah White, Basic Black. Ink: Ranger Distress Black, Copic Markers, Versamark. Other: Sakura Black Glaze Pen, Dimensionals, Circle and Rectangle Nesties, Cuttlebug, December Sky Blingz, Crafter's Tool Kit, Real Red Brads, Gingham Ribbon (Stampin'Up! ), Scallop Edge Punch, Scor-pal. Hope You'll Come and Lounge with Me! !